(*) Did you know that January 21 is the 88th birthday of Kiwanis ? On January 21, 1915, the first Kiwanis club was chartered in Detroit, Michigan. It's been 87 years since our organization, which was originally named the Benevolent Order of Brothers, first took shape, but the Kiwanis family has now grown to than 13,000 adult and youth clubs and more than 600,000 members in more than 70 nations. 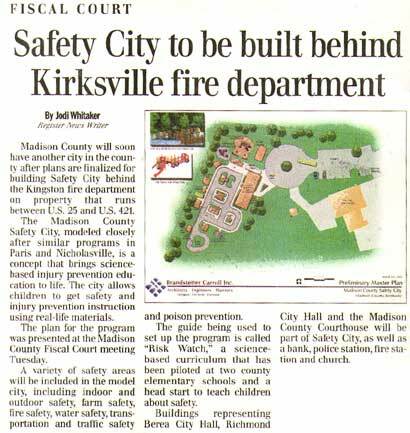 Phyllis Adams reported on the development of Safety City for Madison County and discussed the role that Kiwanis might play in this important new facility for children. Kiwanis will provide $750 toward the Reading Is Fundamental program. This will be a matching portion of the Head Start Reading Is Fundamental grant. 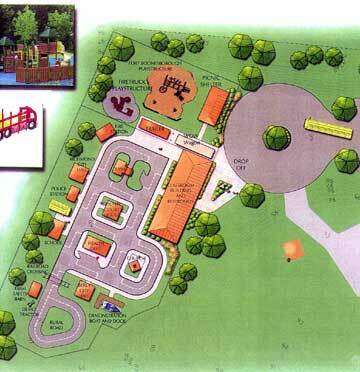 This will be implemented in January, 2003. Health Fair was conducted at Parks & Recreation Site - spent a total of 4 hours - 55 people involved - $165 of Kiwanis funds invested in this event. Health and Child Safety Fair was conducted at the Waco Elementary School - spent a total of 4 hours - 200 people involved -$200 of Kiwanis funds invested in this event. Three training sessions for child care directors/staff were provided - spent a total of 6 hours - 58 people involved - $50 of Kiwanis funds invested in this event. Transportation and Fire Safety instruction was conducted at the Richmond Head Start - spent a total of 3 hours - spent at total of 80 - $104 of Kiwanis funds invested in this event. Safety Day at the Berea Wal Mart - spent at total of 4 hours - 60 people involved - $120 of Kiwanis funds invested in this event. Preparation and distribution of drug prevention materials was disseminated at EKU Homecoming Colonel Country tent - spent at total of 10 hours - 700 people involved - $900 spent on this event - Substantial Kiwanis funds invested in this event. Drug prevention activities at the following schools via the WOW Wagon was conducted at the Berea, Bluegrass Christian, Kit Carson, Kirksville, Mayfield and White Hall schools- spent a total of 35 hours - 2,000 people involved - $1,000 of Kiwanis funds invested in this event. Child Safety was presented at the Richmond Parks and Recreation Boo Bash - spent a total of 3 hours - 125 people involved - $100 of Kiwanis funds invested in this event. The Wellness on Wheels Wagon (WOW), one of the many projects supported by the Richmond Kiwanis, distributes health information to youth and schools in the Madison County Area. Seen here is Phyllis Adams, Richmond Kiwanis member, who is seen providing information at the Berea Spoonbread Festival. The wagon was also provided information to youth at the Kiwanis Carnival. ONE: I started out with nothing, and I still have most of it. TWO: My wild oats have turned into prunes and All Bran. THREE: I finally got my head together; now my body is falling apart. FIVE: All reports are in; life is now officially unfair. SIX: If all is not lost, where is it? SEVEN: It is easier to get older than it is to get wiser. NINE: It's hard to make a comeback when you haven't been anywhere. TEN: The only time the world beats a path to your door is when you're in the bathroom. ELEVEN: If God wanted me to touch my toes, he would have put them on my knees. TWELVE: When I'm finally holding all the cards, why does everyone decide to play chess? THIRTEEN: It's not hard to meet expenses...they're everywhere. FOURTEEN: The only difference between a rut and a grave is the depth. FIFTEEN: These days, I spend a lot of time thinking about the hereafter...I go somewhere to get something and then wonder what I'm here after.